Seaman Schepps bronze colored shell and citrine gold ear clips circa 1990. The classic Seaman Schepps shell design featuring unique characteristics. We like that the color of the shells is uncommon, a very attractive bronze made even more appealing by the natural iridescence of the shells themselves. They also have faceted citrine caps, as opposed to the more commonly seen cabochons. They are very special and the large size! What is there not to love about that? Crafted in 18-karat gold, in very pristine condition consistent with age and wear. Celebrate Yourself and consider these delicious earrings as a treat for today. Make Yourself Happy! 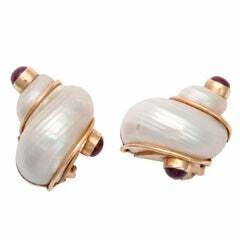 And if that won’t be the case, imagine just how Happy you will make that important person in your life by gifting these fabulous Seaman Schepps shell earrings as a token of your loving care and affection. It will make you happy too! Knowing that you have chosen with love in mind. For over three decades, we have been in the business of making people Happy by selling a carefully curated collection of antique and estate jewelry. That is what it is all about. DIMENSIONS: approximately 1 5/16” long and 1 1/16” wide overall, omega clip backs. These are the large size. A pair of 18k yellow gold earrings set with sugarloaf cut citrines. The earrings are 34mm x 22mm and weigh 26 grams. Marked: Shell signature mark, 750. Retail $10,500. 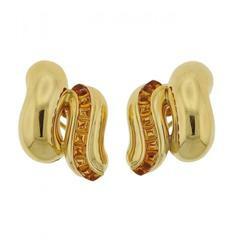 18k yellow gold swirl earrings, crafted by Seaman Schepps, set with 3mm to 7mm pearls and citrines. Earrings are 25mm x 18mm, weight is 11 grams. Marked 750, Shell mark.